Leonberger – the history of this German breed is full of mystery, as various historians have published conflicting versions of the breed’s beginnings. Most agree that Landseer (black and white) Newfoundlands and Saint Bernards were foundation breeds, but the other breeds (including the Great Pyrenees, Pyrenean Mastiff, and others) are uncertain. One interesting fact is that this giant breed was bred primarily as a companion; most German dogs were bred to work. The Leonberger dogs stand 25.5 to 31.5 inches tall and weigh between 100 and 135 pounds. 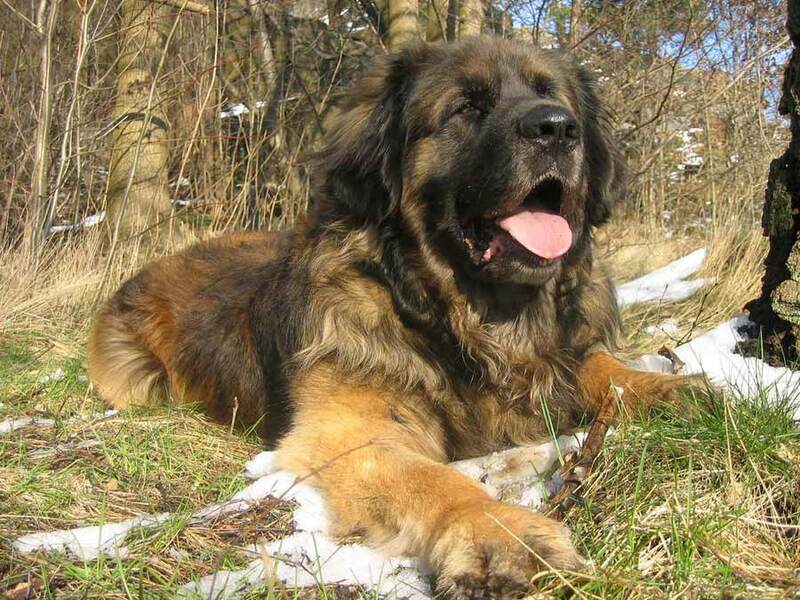 Leonberger is a strong, well-balanced dog breed with a big head that is longer than it is wide. The eyes are brown, the ears are dropped, and the muzzle is black. The tail is long and plumed. The breed has a double coat. The outer coat is medium to long in colors including gold, red, reddish-brown, and brown, all with or without black tips. Leonbergers can cover your house with a lot more fur than a smaller dog can. Their fur can jam your vacuum cleaner many times over! These dogs should be brushed two or three times per week, or more when shedding heavily. This very intelligent, active, playful dog breed needs companionship, daily exercise, and something to keep the mind busy. Many do well as therapy, search-and-rescue, and water rescue dogs. When left alone too long, young Leonbergers can be destructive. Use interactive toys (such as those that dispense treats) to keep Leonberger puppies amused when left alone. The Leonberger breed thrives with gentle, patient, and firm yet fun training. Early socialization is also important, as Leonbergers are wary of strangers. Leonbergers do best with owners who enjoy spending time with affectionate dogs and who want to do things with them. Leos are very good with children and are usually good with other pets, too. The Leonberger breed has some drug sensitivities and can have problems with hip and elbow dysplasia, bloat, and Addison’s disease. Note: Upload only Leonberger picture or your picture with Leonberger below - spammer's ip may be blocked. Our Leonberger Lazarus was a large male. He almost always slept in our room on the floor. He never slept on our bed ( his choice ) I think because there really wasn’t enough room for him to stretch out and be comfortable between my wife and I. One night he seemed “Very” agitated, he paced around the room. I thought he might have heard something downstairs or even might have to go out. I took him out to look around and hopefully set his mind at rest. He / we saw or heard nothing out of the ordinary. When we came back inside and up to our bedroom he jumped up on our bed, snuggled between my wife and I and went to sleep. Both my wife and I commented to each other about his strange behavior, especially his coming to bed to sleep between us. He seemed so relaxed and comfortable. Early the following morning I awoke to go to work ( he always went to work with me) I could not wake him. He had heart failure sometime during the night. His Vet came to our house and decided he had to be put down. We believe that somehow he knew that he was going to die and wanted to spend his final hours close to the people he loved and knew loved him. Lazarus had lived over 11 happy and healthy years with us.